When we donate to an appeal – Lent, Harvest or an emergency – or make a regular gift – we all want to know and trust that our money will reach the people who need it most. Here’s how your compassion and generous support for our Lent appeal in 2018 when you donated a fantastic £4.3 million, which was doubled by the UK government through matched funding, is working to save lives in Zimbabwe. Fiona and her two children in Zimbabwe (above) will receive a vegetable garden. Since last year’s Lenten appeal, our local nutrition experts have been working hard to reach the most vulnerable people – children, pregnant women, breastfeeding Mums and older members of the community – and ensure they’re getting a good meal. So far we’ve reached a total of 4,293 people. And we’re on track to reach 239,000 people across Zimbabwe, Eritrea and Zambia by the end of 2021. One year on from our 2018 appeal, we revisit some of the people you met last year in Zimbabwe. When we met Fiona, she was worried about her youngest son Pardon, who was showing signs of malnutrition. But Fiona and her husband Peter have just received the good news that their village will be receiving a vegetable garden. 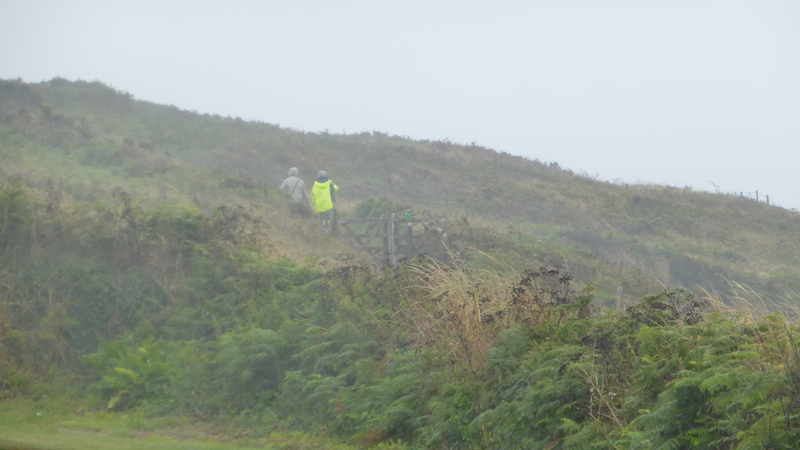 If you have a spare moment, we invite you – our loyal volunteers and supporters, and any other interested parties who are visiting our blog – to take a look at our Annual Review which has been recently published. You can see how the volunteering you commit to for us, transforms lives around the world. Sometimes we hear people say, I am just putting up a poster or handing out Fast Day envelopes – it’s not much to ask. With the greatest respect, we disagree! The cover photo of the report (not the one above) shows: Fatema who is 18 at the Balukhali refugee camp in Bangladesh. Fatema had to flee Myanmar after her home was burnt down and her husband killed by the military. More than 600,000 Rohingya have been forced from their country, often with no possessions and with nowhere safe to travel to, in order to save their lives and those of their families. Countless more who were unable or unwilling to leave have been killed. But thanks to your support, CAFOD, with our local Church partner Caritas Bangladesh, were able to respond to this crisis by providing emergency food, shelter and sanitation supplies to those in desperate need. This report details how your contributions enable CAFOD to help millions of people like Fatema each year, and celebrates the transformational change your prayers, actions and donations help bring about. We want to share just how valuable your contribution is to our work. Thank you. Ten years ago, MPs came together to pass a ground-breaking law: the Climate Change Act. The law was the first of its kind and showed that the UK was serious about tackling climate change. However, ten years on, we know that we need to be going much further and faster with our emissions cuts if we are going to limit the word effects of climate change. We need to set a net zero target before 2050, this means only producing the same amount of greenhouse gases that we take in. A group of MPs have already come together to ask for this by signing a letter. But if we are going to set a new target, we need more MPs to sign up. Please click on the link here to sign a card to your MP and ask them to be a Zero Hero. We are delighted to have Barbara Davies, our colleague in CAFOD who works as country representative for Colombia, Peru and Bolivia, will be giving a presentation on the peace process in Colombia at The Temple of Peace in Cardiff on Wednesday 24 October at 12 noon. Barbara has been working on peace and development issues for over a decade across South America. Originally from Penarth, one of the first campaigns she worked on was to create a solidarity and awareness raising link between Wales and Colombia, highlighting the civil war that was taking place there and the amount of people displaced by the conflict. 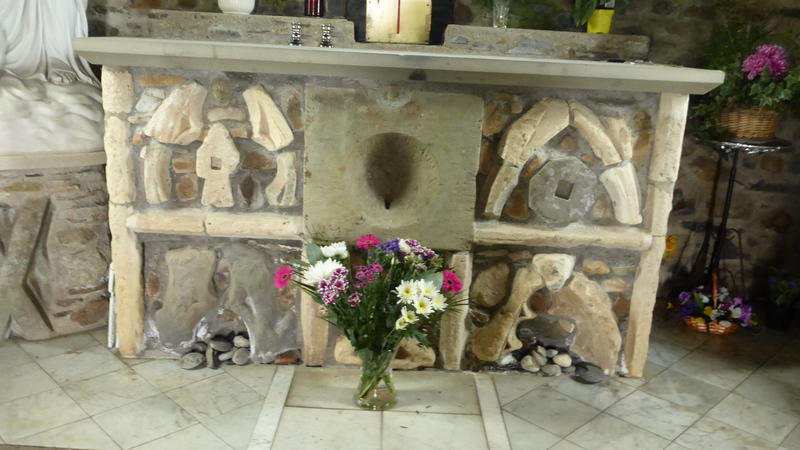 Parishioners from St Joseph’s parish in Penarth and St Mary’s parish in Dinas Powys, came together on Wednesday 3 October to mark the end of Creation time which ran until 4 October, the feast of St Francis of Assisi. This is an ecumenical season dedicated to prayer for the protection of Creation and the promotion of sustainable lifestyles and this dedicated group of volunteers organised a Prayer Vigil and invited other local denominations to join their celebration. 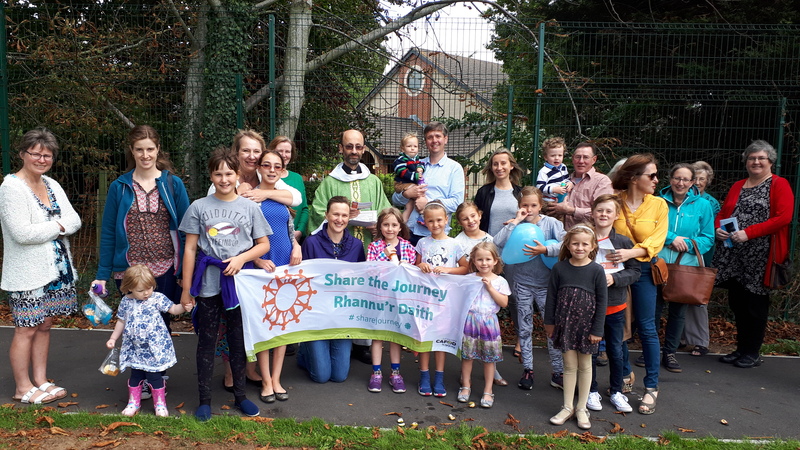 The parish of Our Lady, Queen of Martyrs in Hereford held their Share the Journey walk after early Mass on Sunday 9 September. At the end of Mass, CAFOD’s Share the journey presentation was shown to the congregation and the silence in church was palpable and powerful as myths were debunked and the reality of the journeys some of our brothers and sisters are forced to make were starkly laid bare. We don’t usually publish an Ebulletin in August as so many people are away, but we thought that it would be useful to give you an early heads up of dates for forthcoming events. Saturday 1 September Day of reflection at Ty Croeso Centre, Llantarnam Abbey from 11 am to 4 pm. (Coffee from 10.30 am). Free event, please bring a packed lunch. We are meeting on the 4th World Day of Prayer for the Care of Creation – as instituted by Pope Francis. 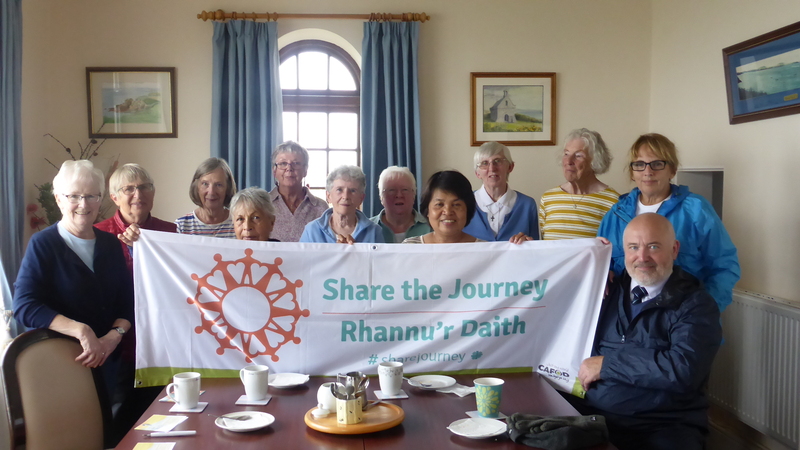 Sunday 9 September– Share the Journey walk following Mass at Our Lady, Queen of Martyrs, Hereford. Monday 17 September – Education Refresher Day in the Mostyn Room (next to St David’s Cathedral in Cardiff) 10-4 pm. Existing and potential new School volunteers explore the Family Fast Day resources. Saturday 22 September – CAFOD Supporter Day at Our Lady, Star of the Sea, Promenade Terrace, Mumbles SA3 4DR. We have requested a speaker for the event, tbc. Saturday 29 September – CAFOD Supporter Day at Our Lady, Queen of Martyrs in Hereford, following on from the Soup Kitchen (12-2) starting at 2.30-4 pm. We have requested a speaker for the event tbc. 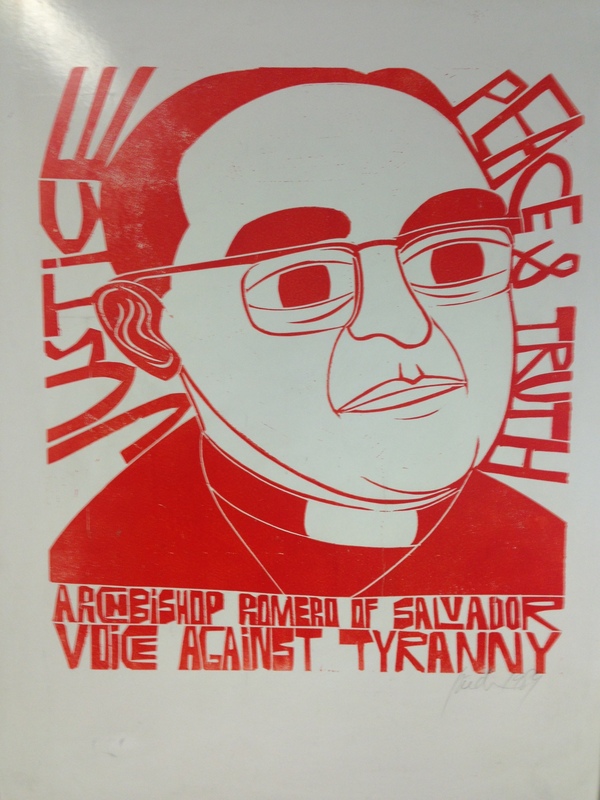 Saturday 6 October – Oscar Romero talk by Clare Dixon. Clare has been Head of CAFOD’s Latin America programmes for nearly 40 years – and since its inception in 2005 she has been Secretary of the Archbishop Romero Trust. Join us at The Cornerstone, Cardiff (opposite St David’s Cathedral) Time 7 pm (following Mass in the Cathedral at 5.30 pm). Saturday 10 November – Campaign retreat day at Downside Abbey (10-4 pm). Countering Consumerism: Lessons from Gaudete et Exsultate. All welcome. Book here. 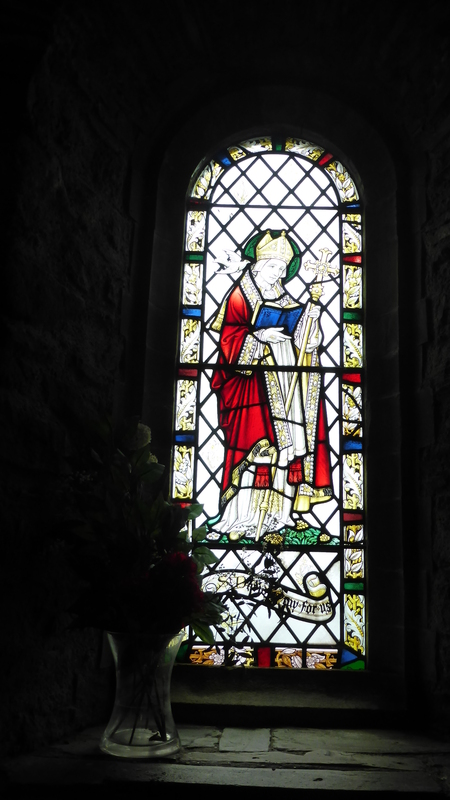 Monday 12 November – Memorial Mass for the Diocese of Menevia at St David’s Priory Church, Swansea at 12.30 pm. All welcome. Monday 19 November – Memorial Mass for the Cardiff Archdiocese at St Helen’s Church, Nantagarew Road, Caerphilly CF83 3FB at 7 pm. All welcome. Tuesday 27 November – CAFOD Education Training Day 2 (10-4) in the Mostyn Room, adjacent to St David’s Cathedral in Cardiff. 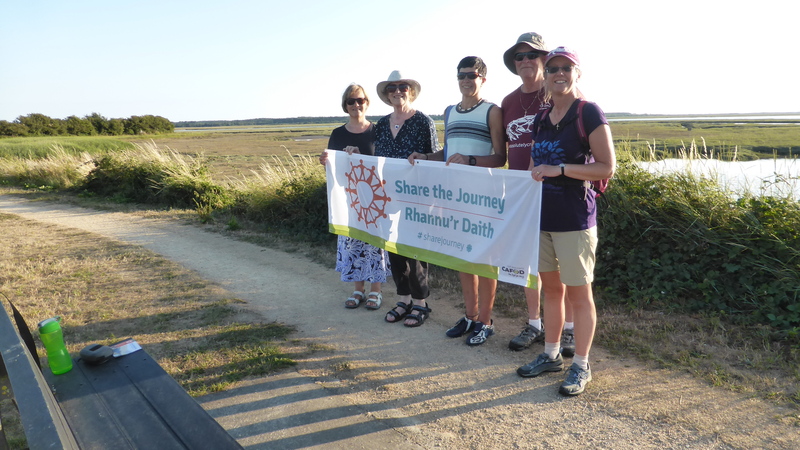 August has been the month when a number of parishes around the Archdiocese have chosen to hold their Share the Journey walks. And we could all be forgiven for thinking that Saturday 11 August would be a wonderfully warm Summer afternoon, after the heat-wave the UK had been experiencing in the previous weeks. 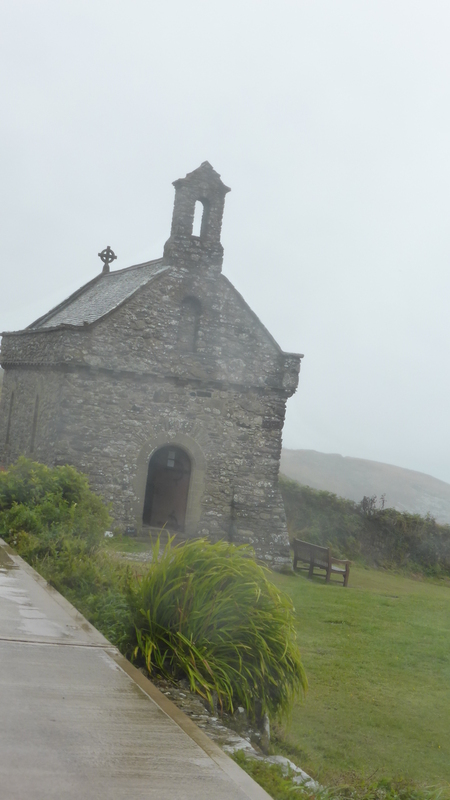 However, CAFOD supporters from the parishes of St Michael’s in St David’s and Holy Cross in Fishguard woke up to lashing rain and high winds off the coast of Pembrokeshire on the morning of their walk of solidarity to raise awareness of the plight of refugees and migrants in the run up to UN talks and new compacts due to be agreed in September and December this year. A band of intrepid walkers, led by Naomi and Esther, set off from the towering cliffs which sandwich the small, rocky cove of Caerfai Bay situated about one mile south of the beautiful and popular city of St David’s. It’s the smallest city in the UK and earns its status as a city from the magnificent cathedral of St David’s which was built in the twelfth century on the banks of the River Alun. 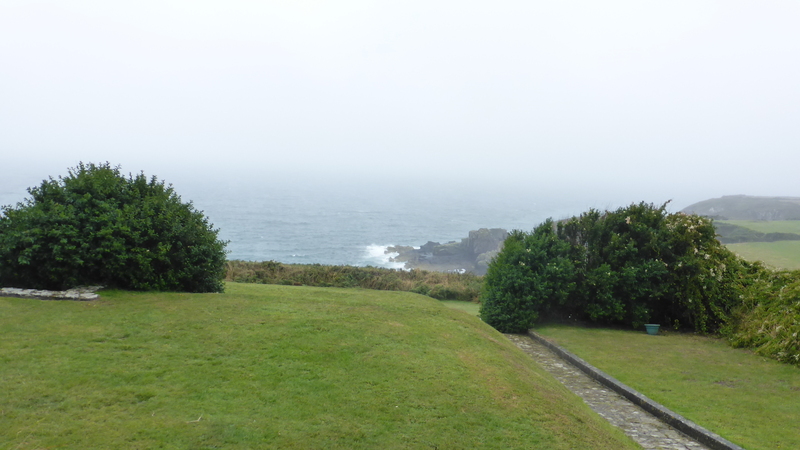 The scheduled walk along the coastal path from Caerfai Bay, buffeted by driving rain and strong winds, to the isolated, spiritual retreat of St. Non’s. 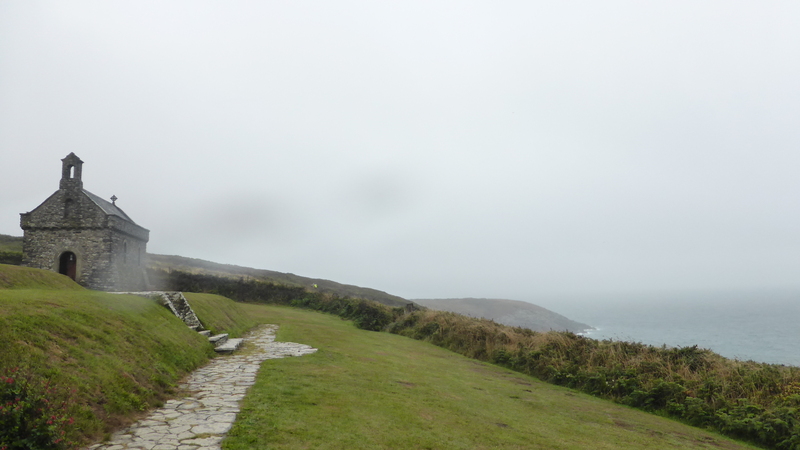 In a windswept field off the Pembroke coastal path we were able to see the ruins of St Non’s ancient chapel. 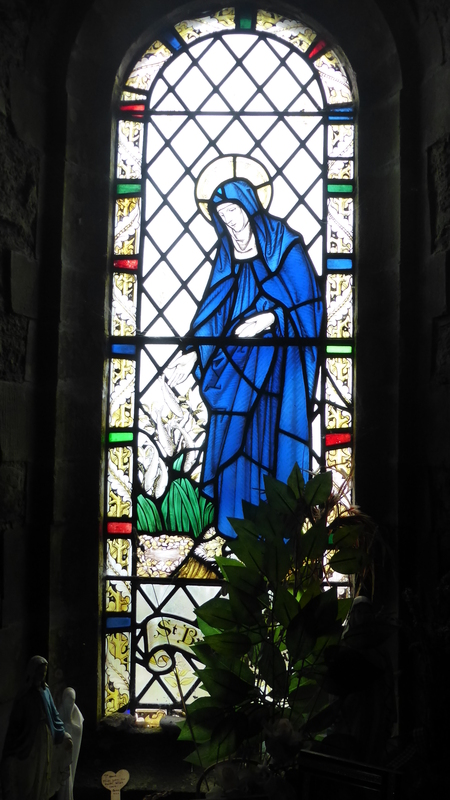 St Non was the mother of St David. There is a small shrine dedicated to her in the corner of the field. 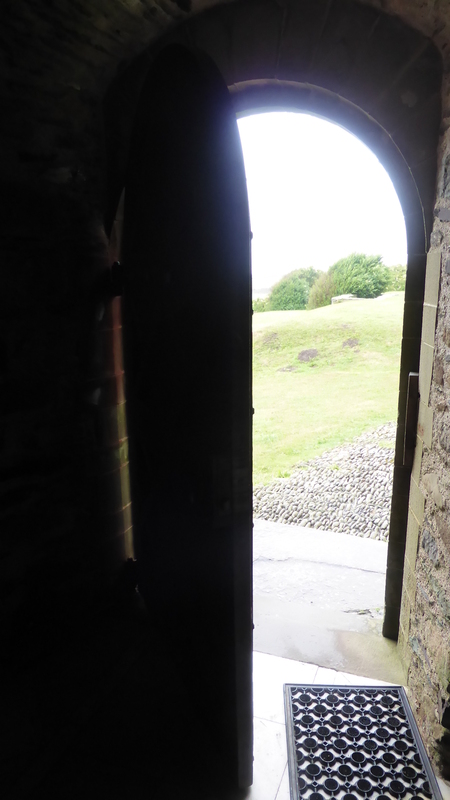 A covered well is also there which would have been essential to the local community back in the sixth century. Everything is beautifully tended and cared for. Sisters of Mercy run the St Non’s retreat centre and they gave us all a warm welcome and treated us to a lovely hot cuppa and a selection of very welcome biscuits. Close by is a tiny chapel built in the 1930s. It’s door is always open and it boast ancient relics that have been rescued from neighbouring cowsheds! 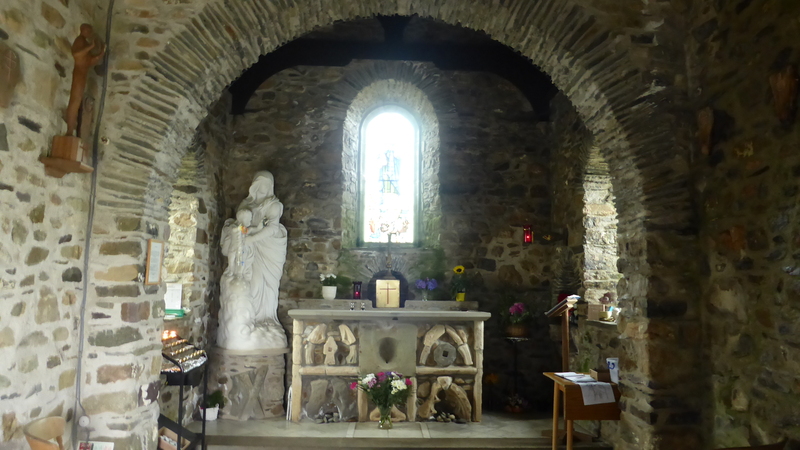 This part of south-west Wales created the Welcome Fishguard Community Sponsorship Group which was one of first towns to respond to a UK scheme first announced in July 2016 by then Home Affairs Minister, Amber Rudd and Justin Welby, Archbishop of Canterbury. 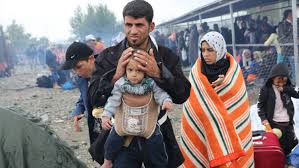 The scheme adopted a new approach to refugee resettlement in the UK which aims to prevent refugee families from feeling isolated and struggling to adapt to their new surroundings which can lead to higher rates of unemployment, stress, depression a nd other problems. Under this new UK Community Sponsorship program, local groups agree to sponsor refugee families and help them integrate into life in the UK. They help their new families find housing, access medical and social services, arrange English language tuition, and support them with employment, leading to self-sufficiency. Community sponsorship enables local people to take responsibility for resettling a refugee family, supporting and empowering them to rebuild their lives. In Wales, there are thirteen community groups already sponsoring families. Under the umbrella of Hiraeth Hope, Fishguard residents have worked with others in Haverfordwest and Narbeth to sponsor Syrian families. Groups have also formed in Cardiff, Aberystwyth and Cardigan. Hiraeth Hope was set up in 2015 to connect groups in towns across Wales who wanted to sponsor refugee families under the community settlement programme. A note on their website says that being inclusive and generous is part of Welsh culture: “the Welsh language word for “Welsh” is “Cymro” which means “one of us.” These towns are living up to the heritage of inclusiveness. It’s not too late to organise a card signing in your parish. You can sign our petition to the UK government. We are hoping that more of you will organise a simple walk around your church grounds to show your solidarity with people who are forced to flee their home through war, persecution, poverty or climate change. Debunk the myths with our factsheet. 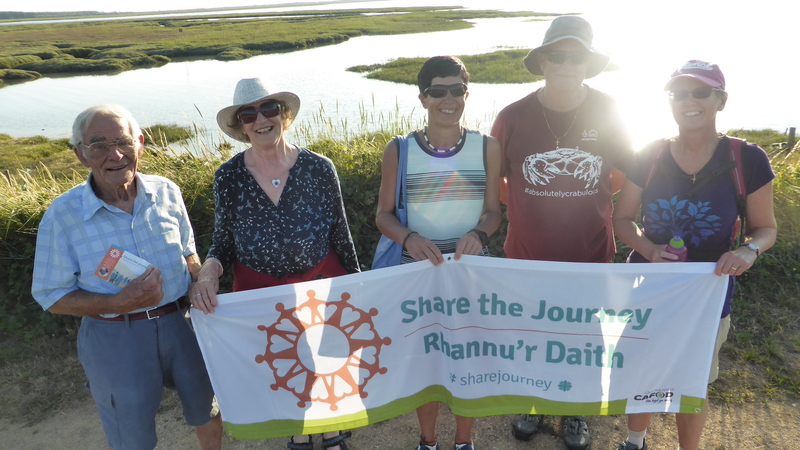 Parishioners from Holy Cross parish in Pontyberem near Carmarthen chose to make their Share the Journey walk at Kidwelly Quay which is located on the north bank of the Gwendraeth estuary. 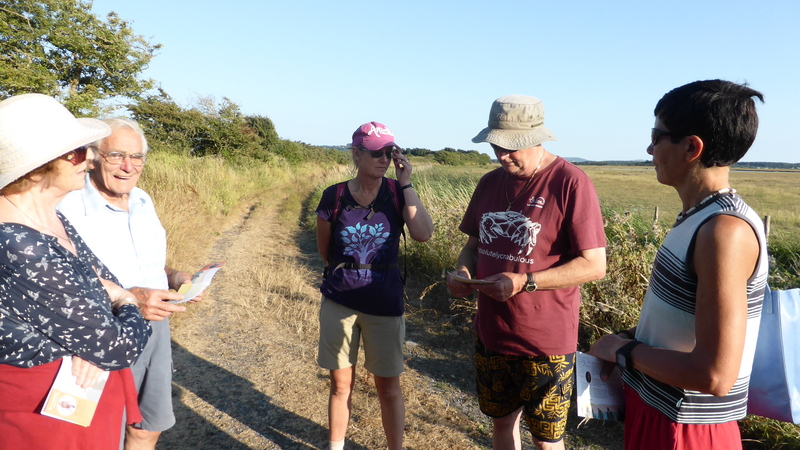 We were guided by seasoned CAFOD campaigners, Paul and Stella Westmacott who are enlightened nature lovers and conservationists who embrace a liveSimply lifestyle. 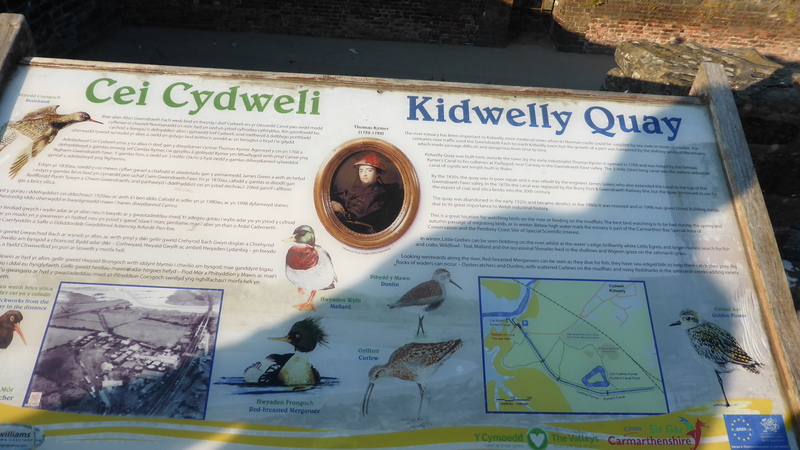 And it was no surprise that the location chosen: Kidwelly Quay – is a Special Area of Conservation which attracts large numbers of birds to the sand and mud banks of the Gwendraeth River. 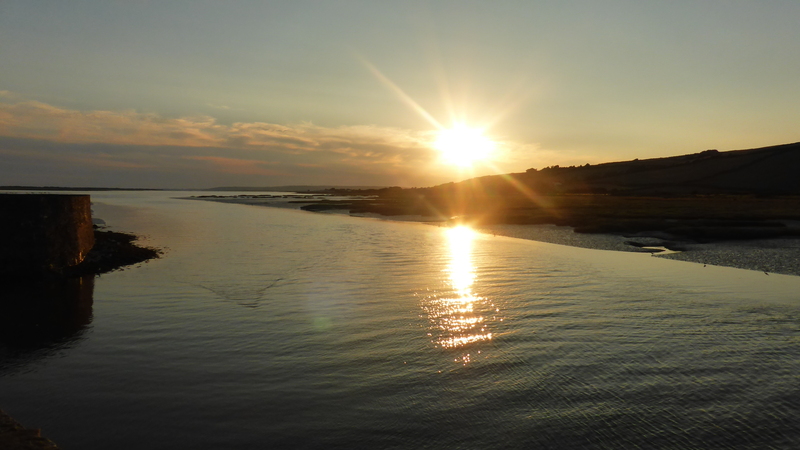 Wednesday 26 July was one of the most glorious Summer evenings we have enjoyed for a long time. The temperature was still high as we set off at 6.30 pm but the wonderful, peaceful environs: the canal walk, salt marsh creeks with wildlife chirruping out of view, and a fresh-water pond all contributed to a very reflective walk surrounded on all sides by the beauty of creation in all its glory. The setting we enjoyed was so far removed from that which many of our displaced brothers and sisters are facing around the world. That very fact heightened the poignancy of the heart-rending stories we shared together. Share the journey is a global campaign to promote Pope Francis’ “culture of encounter” whose goal is to increase the spaces and opportunities for migrants and local communities to meet, talk and take action. We want to be welcoming and speak up for the rights of migrants and refugees. There are many reasons why people migrate. War, persecution, natural disaster and poverty force millions of people from their homes. Most come from poor countries, and seek safety in poor countries nearby. We cannot turn away. These are human beings with hopes, fears, desires and stories to share, just like each one of us. Whatever the cause, migration has an impact on the place and the people left behind, the place of transit and the place where people eventually settle. Pope Francis has declared this moment in time as a ‘unique opportunity’ for us to press our governments to make global commitments which place the human dignity of people on the move at their heart. Every encounter is an experience of otherness. It begins with recognising that our humanity is made up of different faces, stories and cultures. We carry this diversity within ourselves, while being united by the same dignity. The violation of human dignity, a founding value of the individual, has unfortunately happened throughout the history of humankind. It is the most serious evil and the origin of many other evils – from poverty to exclusion, from hoarding of resources to the accumulation of enormous riches in the hands of a few, from violence to wars afflicting millions of humans beings. 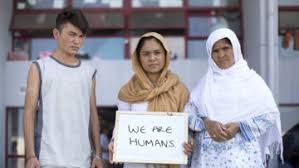 To create a true, deep culture of encounter we must ask ourselves above all – as human being and parish communities – how Jesus would relate to the major modern exoduses of refugees and migrants? How would he respond to the poor people who look for refuge in our communities? In the Gospel, we see how Jesus meets with marginalised people without any fear. He enters into the concreteness of their lives, their anxieties and their concerns and he helps them come out of their anonymity. They are no longer numbers, but faces and real stories. Today we are facing major challenges, due, among other things, to the unsustainable model of development, a source of growing inequalities, precariousness and forced exoduses of millions of people from their own lands. Many paradigms known up to today about human existence on the earth have been thrown into crisis: the availability of food, water, energy and natural resources, climate change, migration, inviolability of borders, the different interpretations of democracy, the models of family life and relationships. Trying to face these challenges and overcome the crisis in a positive way is not simple. These changes are not only taking place quickly but they are also taking place at the same time, all over the world, and at the same time in the whole world. 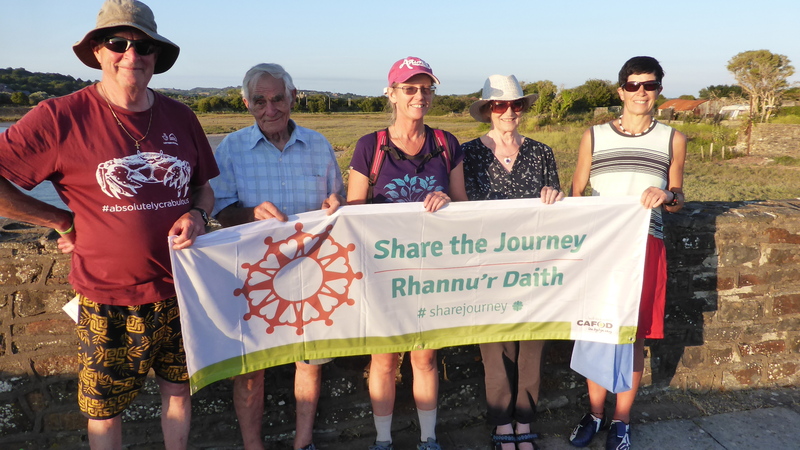 The Share the Journey campaign is a start: to walk together in diversity and unity of faiths and religions, growing in reciprocal knowledge and respect , in communion and in common commitment for a fairer and more human world. Find out more about the UN agreements on Refugees and Migrants due to be adopted in September and December this year. We all have a role to play in ensuring that the UN compacts keep human dignity at their heart. How can you help? 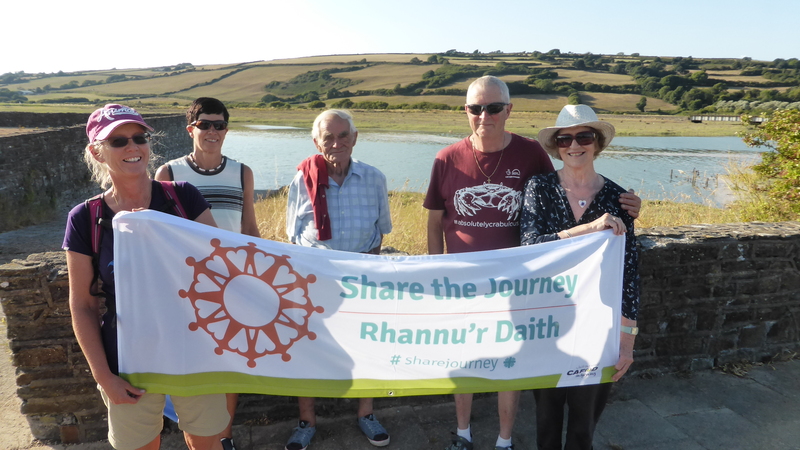 Why not organise a Share the Journey walk in your parish? If you want to chat about getting involved, please get in touch with us or email us.